Feedback is one of the top 10 influences on student achievement. John Hattie’s research has focused on feedback for a long time. In 2011 John Hattie contributed to a publication by Sutton, Hornsey & Douglas about Feedback: The communication of praise, criticism, and advice with an article about ‘Feedback in schools’. Giving is not receiving: Teachers may claim they give much feedback, but the more appropriate measure is the nature of feedback received (and this is often quite little). The culture of the student can influence the feedback effects: Feedback is not only differentially given but also differentially received. Disconfirmation is more powerful than confirmation: When feedback is provided that disconfirms then there can be greater change, provided it is accepted. The power of peers: Interventions that aim to foster correct peer feedback are needed. Feedback from assessment: Assessment (…) could and should also provide feedback to teachers about their methods. provide feedback after learners have attempted a solution. 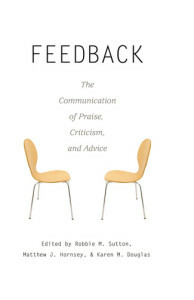 You can buy the book on Amazon.com or on Amazon.co.uk: Sutton, Hornsey & Douglas(2011): Feedback: The communication of praise, criticism, and advice. The article I read is called Feedback in Schools, by John Hattie. Providing students with opportunities to practice and point out areas that need additional practice/redirection and next steps is essential to continued academic growth and achievement. Too often the teacher “thinks” the observer wants to see academic tasks completed perfectly and therefore the teacher will opt to perform certain tasks, such as reading directions to the class instead of asking for volunteers for fear of loss of time or a mistake. Part of the process of observing teaching is the manner in which the mistake is identified and redirected by the teacher so that real learning can take place. The observer is not there to see how perfectly everyone performs a task with little or no need for academic interventions and or reteaching. In order to provide feedback that is meaningful circulation with less teacher centered instructional time is essential. Students need to see that making a mistake is part of the learning process; with consistent meaningful feedback students will become greater risk takers and achieve greater academic success. 14 other websites write about for "Feedback in schools by John Hattie"